I was stupid enough to go to Anthropologie three days before Christmas. My sister and her husband were coming and getting her a gift had been on my to-do list for about two weeks. But I hate the mall and I hate shopping, so I put it off until I couldn't anymore. As I was standing in a checkout line that went all the way to the door with every other last minute shopper in Dallas, I had plenty of time to check out the jewelry they strategically place near the checkout line. 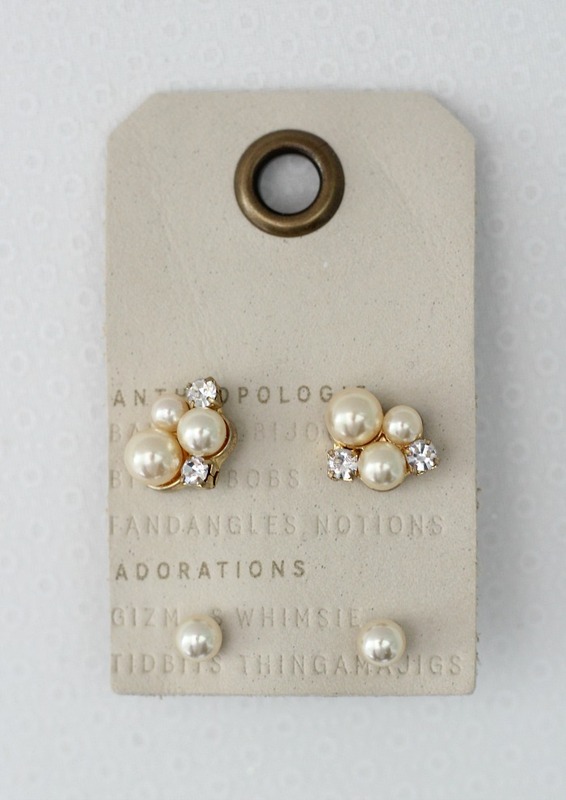 I immediately loved these antique pearl studs! And two pairs for $38? I decided to get a gift for me, too. I put them on in the car and by the time I was home (we're talking a five minute drive) my ears were red and itchy and I had a headache to boot. If this sounds familiar, read on for how to wear cheap jewelry when you're allergic to it. I've been allergic to inexpensive metals for as long as I can remember. 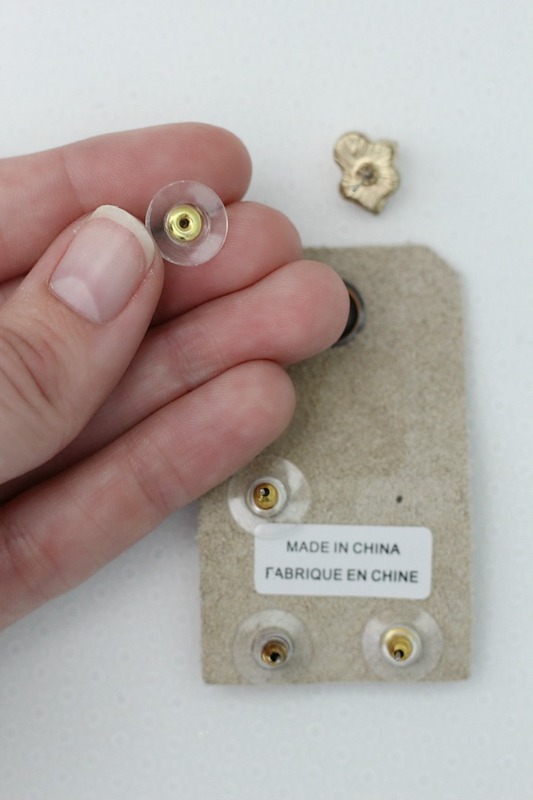 When I got my ears pierced at the age of six or seven, I got real gold studs. After they healed, I headed over to Claire's (who remembers Claire's?! Is that chain still around?) and spent some of my allowance on trendy, cheap earrings. Shortly after that, I learned that cheap earrings were a no-go for me. It's gotten worse as I've gotten older! Within a few minutes, I can tell if a pair of earrings are anything less than 14k gold. I can't even wear 10k gold - there's too much nickel mixed in. I should have known when I got these that I'd have a reaction. Anytime an earring has a back like this, I find I'm instantly reacting to them. Fun fact: I'm so allergic to metals, when I had scoliosis surgery at 13, they had to use titanium. My back is now full of tens of thousands of dollars of titanium! Not only is it expensive to only buy nice jewelry, but you also miss out on the fun trendy stuff! I love a good diamond stud, but c'mon. I want to mix things up a bit. I remembered a trick my aunt told me about way back when I was just figuring out that I was highly allergic to most metals: Paint the earrings with clear nail polish to coat the metal and protect your skin. 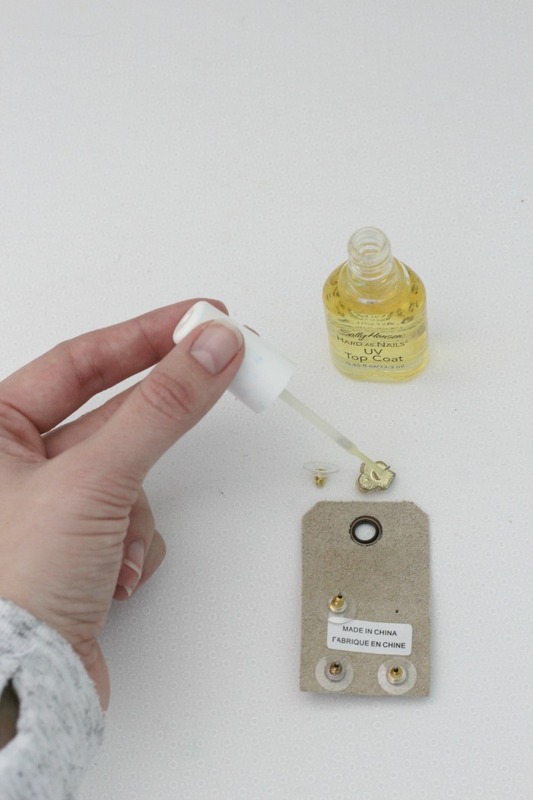 Use a clear top coat so that the nail polish isn't visible. 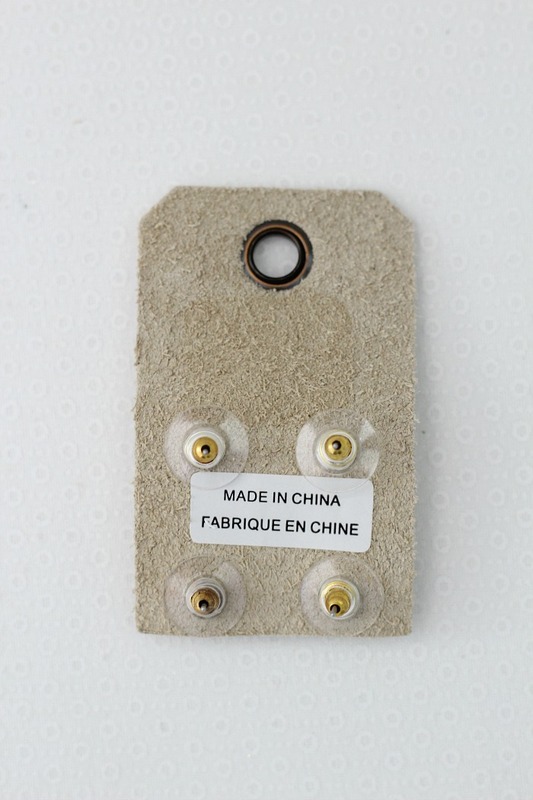 Paint the stud and any of the metal that might touch your ear. I even coated the whole little pearl in polish since it wouldn't show and odds would be good whatever the "pearl" was made of would irritate me too. Don't put too thick a layer on, or it will be too hard to get the back of the earring on. paint the backs too - anything that might touch your skin needs a coat of polish. Let dry until hard. Voila! You can wear trendy, cheap jewelry even if you're allergic. You'll likely have to touch up the coats of polish several times a year (depending on how often you wear the earrings, perhaps more often) to keep the cheap metal fully coated. But using this trick, you CAN wear inexpensive jewelry. I've heard this trick, but have never tried it! I'm the same way with cheap earrings. I have to have gold, although 10 karat is typically fine. I guess because I've had terrible reactions to them, I just don't buy earrings. I have a pair of gold studs I wear practically everyday. I do occasionally wear some Kendra Scott earrings, and for some reason they don't bother my ears as quickly has others. I'm really only bothered by those if I wear them for hours and hours at a time. In college I picked up some cheapies from Forever21 and I thought my ears were going to rot off. HA! I used to do this with the cheapo rings that would leave your fingers green. Clear nail polish always does the trick! Now I can barely even remember to accessorize with anything. I didn't even get a watch on this morning. Love your trick and the fun fact about your expensive titanium back! Claire's is alive and thriving and is my favorite place to take ginny!! They actually are about to file for bankruptcy. They are closing 92 stores as well. You seriously just saved me! Why did I never think of this! I'm the same way and could never wear cheap jewelry. Going to coat the few cheap earrings I have today. What a clever idea! One of my good friends has very sensitive ears, so I'll have to pass this along to her. My ears are super allergic to anything but solid gold. I had always used Neosporin as a barrier (it only works for a few hours) but this is a great idea. I will have to try it! The only way I can wear cheap earrings for even just a couple hours is if I coat them in polysporin. I cant wait to try this! My ears are sensitive and I cant wear cheep earnings for a full day. otherwise I get pain. How long does the polish last for? I really love your tricks and tips on “how to wear cheap jewelry when you’re allergic”. I read many tips & tricks on jewelry, but the way you have shared case by case analysis this is wonderful. So, thanks for sharing such lovely ideas and pictures. I will definitely follow your post. Diamond as well as on Gemstone. 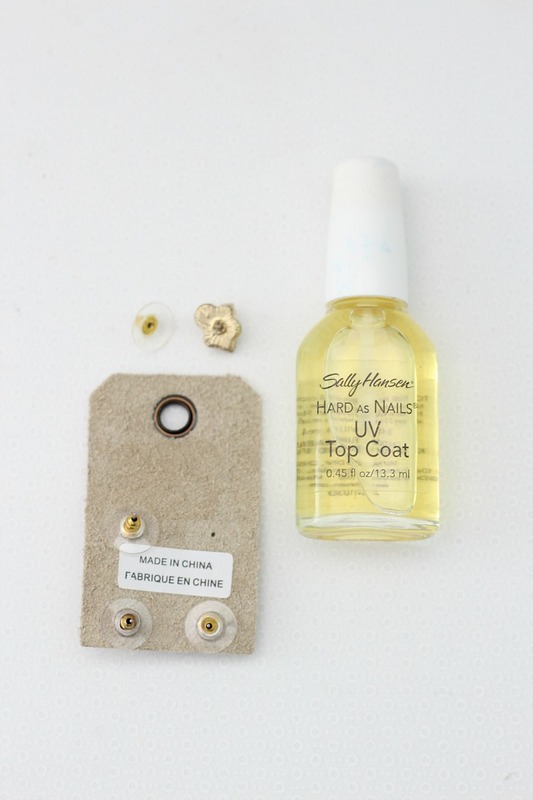 This is a great article, I tried the nail polish hack (along with a bunch of others) but it never worked for me. I finally found that Titanium and Niobium are really the only metals that won't bother my ears because they are non-reactive with the human body (which is why titanium is used for medical implants, like in your back). 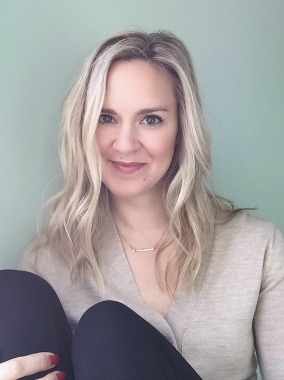 I founded my company, Tini Lux, in 2017 and I sell earrings made with medical grade titanium so they are guaranteed to not cause any pain or irritation. Please check out my website and feel free to email me at info@tinilux.com if you have any questions! I'd love to send you a pair to test out. This trick will sure come in handy for me as I know someone who is allergic to cheap jewelry. Having a variation of jewelry will no longer be a problem now with this tip. I read your post. that's a wonderful article having all details & helpful. I really appreciate that.